For me, it was Carly Simon. Sure there were others…Joni, Billy, Carole, James, Phoebe, Jackson. But Carly was the singer-songwriter who spoke my language. Her points of view on life and love resonated with me and admittedly, shaped my own emotional growth. Carly Simon was someone who had me ponder the concept of “Anticipation”: the loveliness of time spent in the hours we await something or someone we desire. And raised a family of our own, you and me. It’s funny, when you’re too young to comprehend lyrics involving the complexity of mature relationships you may still sing along. They may still feel like they mean something when you’re 12. You’re just not sure what it is they mean.. And then one day, you grow up and they make total sense. Carly Simon was the soundtrack of my youth. I listened to her all the time. I studied her album artwork. The liner notes. I slept with Boys In The Trees under my pillow. That was a perk of an analog world. You can’t sleep in the same bed with a Spotify stream. On an unremarkable afternoon in New York City, I stepped into the elevator of a building on West 57th Street and there she was. No one else. Just me and Carly Simon. And the doors closed. My heart was pounding. Adrenaline racing. Say something! Say something! I knew I had twenty seconds to either say something to Carly Simon or forever regret not saying something. Then again, I could regret saying something. What if I opened my mouth and nothing came out? What if something came out and it was strange? What if I felt like I was invading her personal space in a space from which there was no escape? And what I thought was: Of course I look familiar. You’re a staple in my life. How could you possibly not know me back? What I said was, “Yup. I’m sure.” (As in trust me, If we’d met before I’d remember). I had no regrets. There was no way I could compose myself on-the-spot and conjure something poignant in the 20 second ride to the 26th floor. I think she knew I was freaking out by the way I tried to stare at something — anything else — the button panel on the elevator wall, the framed inspection certificate, my shoes. Or she might have felt something telling in the air between us. Thus the small talk. The kindness. No regrets. My only wish that was one day, under more favorable circumstances I’d have another chance to express myself…thank her for helping me navigate my coming-of-age feelings on the journey of becoming the woman I was to to become. Yes. That’s it. That’s what I’d like to say someday! A few months after my book was published I was out on the town with my work-wife Suzan and I checked my email on my phone. And there in the queue was an email...from Carly Simon. My thought was, who is playing such a cruel joke? That is so mean. I showed Suzan my screen. And she said…click on it click it click on it. But I was afraid of being disappointed. While I hesitated I noticed that the email address contained a word that I happened to know was sacred in Carly’s world. And only people who were into her would know this. So, it was becoming more believable that it could be her. But why on earth would she be reaching out? How did my book get into the hands of Carly Simon? Is she actually prophesying that some day the reason we met in the elevator will reveal itself? My daughter Layla, familiar with a few of Carly’s bigger hits suggested I write back and say ‘you’re so vain, You probably think that chapter was about you.’ I did not do this. It took me a few days to write back. And when I did, I told Carly Simon that I was over the moon to receive her personal note, and that I was still pinching myself, and that I was a songwriter because of her and…I thanked her for helping me navigate my coming-of-age feelings on the journey of becoming the woman I was to to become — words I couldn’t muster in the elevator. Indeed, I got that other chance under better circumstances. Lovely circumstances, as a matter of fact. I always fantasized that one day I’d find myself in Martha’s Vineyard and I’d ring her up and she’d remember me and we’d take that walk among the cherry trees in a park. But it took a while to realize that I don’t need anything else from Carly Simon. (I am careful what I wish for.) I don’t need to write a song with her. To be honest, music we might make together in 2019 could never be as significant as the music she gifted me when I was a young hormonal girl. And besides what if we sucked as collaborators? And…why taint perfectly wonderful memories? I don’t need to share a meal with her or meet for coffee. I don’t want to sit across a table and summon politics, recipes, motherhood, #MeToo, songwriting in the digital age. I don’t even need to take that walk. No. 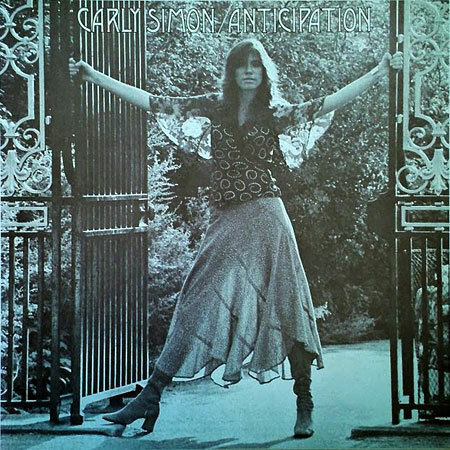 I want Carly Simon to remain what she always was: the muse on the cover of Anticipation with shaggy-hair and a sheer skirt, holding onto the gates on either side of her. I don’t want it to change. I don’t want it to be more. Our universes collided for a brief unlikely kismet moment. Like she said it was “one sweet meeting of you and me” which I wrote about in a book which prompted a note from her, which lead to a beautiful opportunity for me to thank her for rocking my world. That’s all. That’s big. And that alone is the reason why. Thank you for staying connected. Get a copy my “Confessions of a Serial Songwriter”! Soon I”ll have an album. If you'd like to receive my blog via email, please click here. Visit my Serial Songwriter Facebook Page and give it a like if you'd be so kind. Follow me on Twitter and Insta. See you next week!